The Hen House Garden only has two seats. This wooden bench sits by the water near a slowly spreading clump of Darmera. It takes time to reach this secluded spot, and the journey is definitely worth it, even if the hot cup of coffee might be a little cold! In spring the Darmera starts up - pastel pink flower-heads first, followed by foliage. I fell in love with Darmera when I saw it growing in Scotland's West Coast gardens. My clumps are modest in size compared to those! I was there in early summer, too, when everything was green. 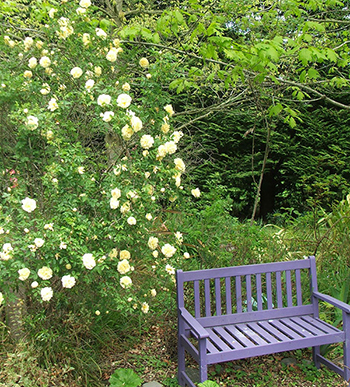 In late spring the big Agnes rugosa rose blooms overhead, her soft lemon flowers filling the sky with fluffiness. Then the fragrant Roseraie de l'Hays behind the bench start flowering. In summer the Oak trees high above provide welcome shade. The autumn leaf tones are a wonderful mixture of golden browns and reds. A few years ago I painted this garden bench purple. It's such a pretty colour for garden furniture, and makes a garden seat just that much more inviting. Now all I need to do is to cut down the Gunnera which has rather rudely pushed in front of the seat, its giant leaves taking up far too much space. 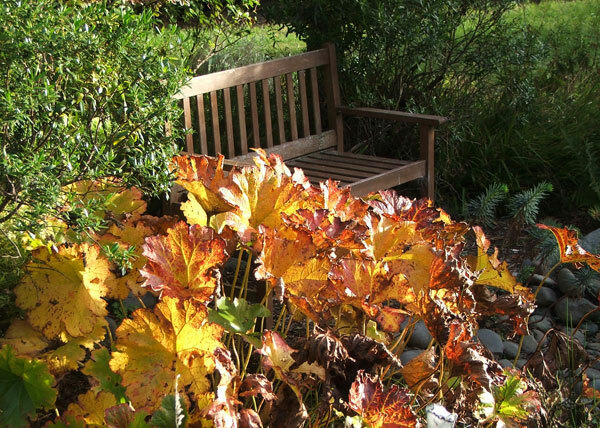 Sitting in a secret, secluded spot is one thing, but fighting off thorny Gunnera stems and rough leaves is quite another matter!